You may have noticed that some iOS apps will turn dark as if they’re being launched and simultaneously rename themselves as “Cleaning…”, seemingly out of the blue and at random. This is demonstrated happening with the attached iPhone screenshot, showing the Instagram app going through the process. 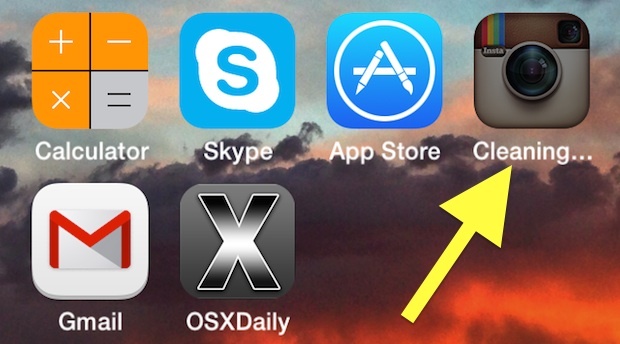 So the big question for many users is, what’s going on here and why does that iPhone or iPad app say it’s cleaning? We’ll explain what the “Cleaning” message means, what it’s doing, and also what it means you, the iOS device user, should do when you see it. In short, when an iOS app name says “Cleaning”, it means that the operating system is going through and clearing out caches and temporary files associated with the app in question. This happens on all iOS devices, so it doesn’t matter if you’re on an iPhone, iPad, or iPod touch, you’ll likely see the same occurrence from time to time. Though the Cleaning process may appear to happen completely at random, the function is almost always triggered by the iPhone, iPad, or iPod touch running very low on available storage space. Basically, when iOS detects that available space is low, it starts looking at apps that have stored significant local data from caches and temporary files, and looks to ‘clean’ that out by deleting the stored cache files. This is why you’ll most often see the process occurring on apps that are downloading data from the internet, like Instagram, Facebook, and Vine, though it can occur on other apps too. Additionally, those app caches and temporary files contribute to making up some of that mysterious “Other” storage space that users will often find when synced to iTunes and wonder about. If you see the “cleaning” process you can confirm that space is running very low by going to Settings > General > Usage, don’t be surprised to see that you have a MB or two, if not the dreaded “0 bytes available” left on the device. Typically when “Cleaning” finishes up, it can free up a few hundred MB of space by dumping apps temp files. Though it’d be convenient to recover some space in a pinch, there is no way to manually trigger the “cleaning” process in iOS except to force your iOS device to run out of space, hardly a practical move. Users interested in taking matters into their own hands can clear out iOS caches manually using the PhoneClean app but it requires connecting the iPhone / iPad to a computer, but it may clear up somewhere between a couple hundred megs to even a GB or two of storage space on a device. Generally the best thing to do if you see that Cleaning process going on your iOS device is to back up the iPhone, iPad, or iPod touch, and then clean things up a bit. We’ve covered a variety of ways to free up some storage space on iOS devices, the gist being that what you’ll want to do is remove some of the stored media like pictures, movies, music, and videos (only after backing up this media, of course), and then go through and delete apps you don’t use often anymore. Don’t overlook message threads too, deleting old iMessage conversations can be a huge factor in recovering space, particularly if you send and receive a lot of multimedia, picture messages, gifs, and videos between friends and family. Once you’re finished freeing up space, you shouldn’t see the cleaning message again for quite some time… at least until you’re running very low on storage again. If you see this often and are constantly running out of iOS device storage, you’ll probably want to take the device size into question when you go to upgrade an iPhone, iPad, or iPod again in the future. 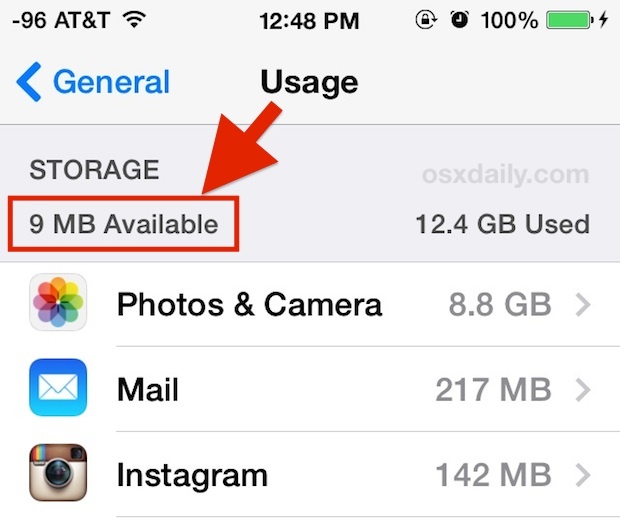 Doubling your available space from a 16GB to 32GB iPhone or 32GB to 64GB iPad can make a huge difference for those who are persistently low on storage (which, let’s face it, is almost all of us). Along those lines, we hope that Apple will boost the minimum device storage offered to 32GB sooner than later, but the likelihood of that happening is probably quite small, at least anytime in the near future. Yes it is on iOS 7.1 only. I also have noticed that, when I click on Clean Junk in the Battery app, even if I have a lot of free space. 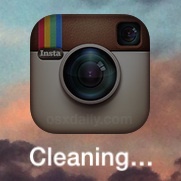 No, the iOS app “Cleaning” process has been around since iOS 5. And what’s the Battery app you speak of? It is “Battery Doctor” on App Store. Really cool app. Hm I have never noticed “cleaning” on iOS 5. I’ve deleted messages a few times, rebooted and even restored my phone. No matter what I do there is always 1.9 GB of “saved” messages that I cannot remove. Any ideas would be greatly appreciated. I use an app called ‘CM Security’ on my iPhone and iPad. Its available from the App Store and is fantastic. It does a proper job of cleaning up any cache from apps and can also be used to free up RAM space as well. I had less than 100 MB left on my iPhone at one point, now I have 2.4 GB!!! That is how much junk was on my phone. You guys might want to double-check on Phone Clean; it’s gotten a bit smarmy in latest iterations, starting with an auto-download when you hit the page- yep, it downloads a DMG file when you go to the site. Danger. It also finds some totally bogus stuff, like 19,000+ ‘Privacy Concerns’ on my phone. And nothing is free in this app any more. Just check it out first. That’s disappointing, when we reviewed Phone Clean it was a great free app that had a paid upgrade that was entirely option with some additional features, none of which included any shady bogus stuff. We’ll look into it, thanks for the heads up! There’s this app I have and It’s cleaning for a while now.. I waited for couple days but It’s still cleaning. I have plently of storage. Why is it taking so long? There’s this app and it been cleaning for 3 days now . Is there something wrong or what do I do ?? When my app “cleaned” some of my settings changed, has that ever happened to anyone else? Why did that happen? Running “Out of Memory” is not always true. I have 128 GB iPhone 6S Plus and just saw GMAIL app “Cleaning…” for minute and then once complete would function normally. On checking,I have 65GB of free storage. Something else triggers the cleaning process. All I can think of is that it is based on file system cleaning and optimization, as I recently recorded about 90 minutes of video using the Photos app. So iOS must have some other criteria to initiate cleaning for given app. My iBooks has been “cleaning for the last two months, so I can’t access anything there. I can’t get it to do anything. I have 1.1 gig of storage left.